Tufenkian Heritage Hotels, a luxury boutique hotel brand based in Armenia, currently has four property projects in the works in Areni village, Karabagh, Dilijan and downtown Yerevan. The hotels, all slated for various openings , starting this year through 2009 will join the three existing hotels in Yerevan, Sevan and Lori in offering agents 15 percent commission on bookings. 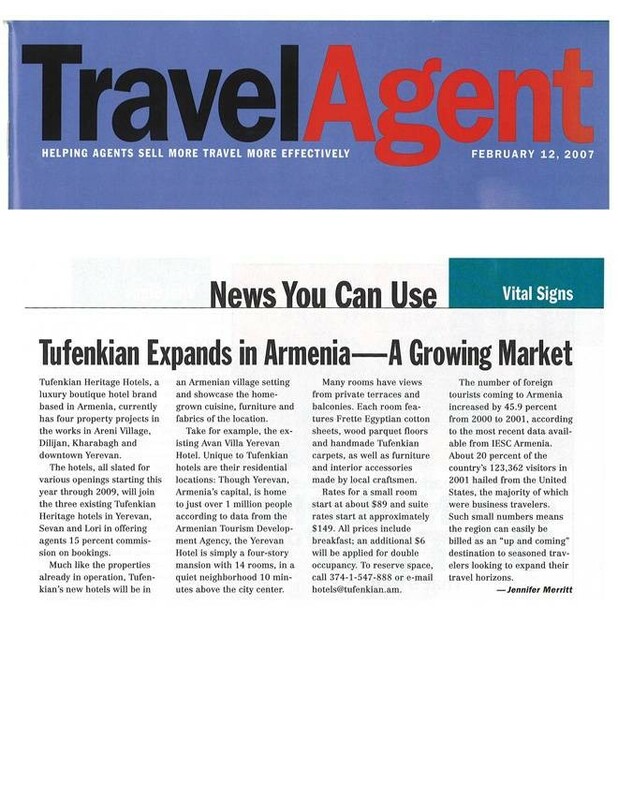 Much like the properties already in operation Tufenkian’s new hotels will be in an Armenian village setting and showcase the homegrown cuisine, furniture and fabrics if the location. For example, the existing Avan Villa Yerevan Hotel. Unique to Tufenkian hotels are their residential locations: Through yerevan, Armenia’s capital, is home to just over 1 milion people according to data from the Armenian Tourism Development Agency, the yerevan Hotel is simply a four story- mansion with 14 rooms in a quiet neighborhood 10 minutes above the city center. Many rooms have views from private terraces and balconies. Each room features Frette Egyptian cotton sheets, wood parguet floors and handmade Tufenkian carpets, as well as furniture and interior eccessories mde by local craftsmen. Rates for a small room start at about $89 and suite $149. All prices include breakfast and additional $6 will be applied for double occupancy. To reserve space call 374 1 547888 or e-mail [email protected]. The number of foreign tourists coming to Armenia increased by 45.9 percent from 2000 to 2001, according to the most recent data available by IESC Armenia. About 20 percent of the country’s 123,362 visitors in 2001 hailed from the United states, and the majority of which were business travelers. Such small numbers meana the region can easily be billed as an “up and coming” destination to the seasoned travelers looking to expand their travel horizons.